(July 7, 2016) – The Portland Bureau of Transportation and Portland Police Bureau announced the results of a crosswalk safety education and enforcement action that took place on Wednesday from 10 a.m. to noon at the marked crossing on NE Sandy Boulevard at NE 85th Avenue to raise awareness of pedestrian safety and Oregon traffic laws. The results of Wednesday's action included 33 citations with 43 violations (some citations had multiple violations) and one warning. A mom pushes a child in a stroller across NE Sandy Boulevard at 85th Avenue, where she said she has been nearly hit by drivers who failed to stop. A plain clothes Portland Police officer in the background was conducting a crosswalk education and enforcement action with PBOT on Wednesday. Photo by Dylan Rivera, Portland Bureau of Transportation. 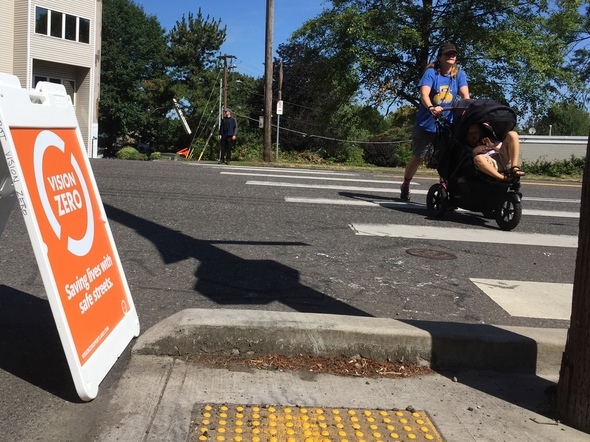 Also on Wednesday, PBOT announced that a federal grant recently approved by the Oregon Department of Transportation will fund a new rapid flashing beacon at the NE Sandy and 85th Avenue crosswalk. PBOT hopes for construction in 2017. Sandy Boulevard is one of Portland’s 10 designated high crash corridors. This location has bus stops on both sides of the street and is within close proximity to businesses, restaurants, a senior living facility and The Grotto, a prominent destination for 300,000 visitors annually. 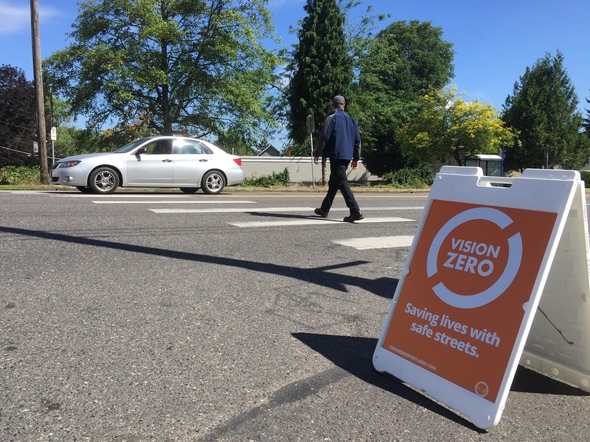 Education and enforcement actions such as the July 6 event are a key part of the City of Portland’s citywide effort to reach its Vision Zero goal of eliminating traffic fatalities and serious injuries. Under Oregon law, EVERY intersection is a legal crosswalk whether it is marked or unmarked. People driving must stop and stay stopped for people walking when the pedestrian is in the travel lane or the adjacent lane. A plain clothes Portland Police officer in the background was conducting a crosswalk education and enforcement action with PBOT on Wednesday. Police officers waiting nearby issued citations and warnings. Photo by Dylan Rivera, Portland Bureau of Transportation. Each crosswalk enforcement action involves a designated pedestrian crossing at a marked or unmarked crosswalk while police monitor how people driving, bicycling and walking adhere to traffic safety laws. Drivers who fail to stop for pedestrians in the crosswalk and pedestrians who fail to follow Oregon traffic laws may be issued a warning or citation. A Portland police officer served as the designated pedestrian crossing the street during Wednesday’s action.